Why "Rent a Jet" Beats Travelling Business Class, Every Time! In business, time is money, literally. There is no better way for the busy, business executive to save time and money, when traveling, than with Rent a Jet (Talon Air). Talon Air's eleven (11) years' experience in private luxury travel ensures that you get to your destination safely and securely, in comfort, thus enhancing your chance of business success, by being completely at ease during travel. For years, airlines have advertised the "convenience" of business class travel. However with this mode of travel, you still have to check in at the airport, wait in line (albeit having a shorter wait-time than that of economy class), wait in the airline's business lounge, change flights (for longer journeys) and to make matters worst, when you board your flight, have your "private" in-flight conversations heard by fellow passengers. Even though business class on some flights offer enough leg room, you are still constricted by the seat size, which prevents restful sleep on longer flights, e. g. those involving intercontinental travel. ...leaving you at ease to think clearly for that important business meeting or to make last-minute touches to that important business presentation (in your own time), before you land at your destination. 6) Complete privacy and anonymity than having to travel business class. So, if you want to travel in luxury and comfort, why not skip business class and travel with a reputable company that will get you to your destination safely? Make Talon Air your travel partner of choice, when planning your next business meeting. For our friends living in Europe, who travel frequently, or for those who travel to Europe for business or pleasure, there is exciting news! SESAR, a joint undertaking between the European Commission & Eurocontrol and over 100 partners from the aviation sector, is modernizing the European air traffic management system (ATM) . They estimate that the number of European flights is expected to increase at a rate of 5% per year, to reach 16.9 million flights in 2030. If the air traffic management system (ATM) does not improve, chaos will reign. As such, they are developing new technologies and flight procedures to eliminate any problems that the increase in flights may cause. SpaceShipTwo with wings in feathered position. And we believe that every business should have future plans of up to 100 years. Well, we've always had an interest in the Virgin Group, not only because of its successful partnerships and acquisitions, but because of its sometimes eccentric but very futuristic founder, Richard Branson. For the past 15 years he's been working at trying to fly people to outer space, commercially (space tourism) and finally it seems as if his dream will shortly (within the next 3 years) become reality. Article, "First commercial space ship tested" tells of the successful flight of the VSS Enterprise (SpaceShipTwo), the world's first commercial space ship. It was developed by Virgin Galactic, aka "The SpaceShip Company", which is founded by Richard Branson and Burt Rutan, a renown aerospace designer and engineer. The space ship was released from its mothership "Eve", on Monday, at an altitude of 45,000 ft.
(Normal commercial planes fly at altitudes of between 30,000 - 37,000 ft.). The spaceship is attached to the mothership, which provides the rocket power to get the spaceship up into the air, then, eventually, out out of the earth's atmosphere and against the force of gravity, into outer space. The mothership then releases the spaceship in space. The spaceship then smoothly glides in space (whilst being manned by pilots). The spaceship then reattaches to the mothership for re-entry to earth. According to Wikipedia article,"SpaceShipOne", SpaceShipOne, the predecessor to the VSS Enterprise (SpaceShip Two), completed the first privately funded spaceflight on June 21, 2004. At that time it became the first privately funded manned spacecraft to exceed 100km altitude, and the first privately funded reusable manned spacecraft]. 2) For the pilots to free fly and glide back and land at the Mojave Air and Space Port in California. Both goals were successfully achieved. One of the pilots, Pete Seibold, said that the VSS Enterprise was a real joy to fly considering that it's not only meant to be a spaceship, but one the worl'd highest altitude gliders. Virgin Galactic is currently booking people for space travel. Tickets cost US $200,000, with a mandatory deposit of US $20,000. So far they have had 370 customer deposits totalling $50 million. If you had the money, would you be willing to fly commercially in space? 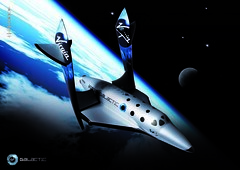 Please click on the links in this post in order to learn more about the VSS Enterprise and Virgin Galactic. (I would like to thank Virgin Galactic for the use of their Flickr inset photo entitled, "SpaceShipTwo with wings in feathered position"). 3) Answer to question, "What altitude do passenger aircraft usually fly at? ", via Answers.com,accessed on October 15,2010.